Built in 1913, this classic Edwardian eight-story building contains 16 cooperative apartments. 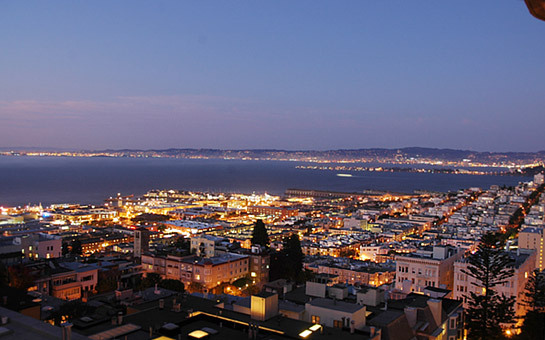 2164 Hyde Street is located on Russian Hill and enjoys views of the bay and city from three exposures. The Alice Marble Tennis Courts are located across the street off the Greenwich Street cul-de-sac. The Hyde Street cable car line is especially convenient to Fisherman's Wharf and Union Square destinations for shopping, dining & entertainment! The elegant lobby and refurbished elevator provide a gracious welcome. Custom interior paint gives beautiful emphasis to intricate original molding detail and refinished hardwood floors add the finishing touches to the gracious and light apartment. The FOYER introduces the fine architectural detailing of the apartment, including: rounded bay windows, exquisite crown moldings, & glass or mirrored French doors. French doors open to the spacious LIVING ROOM with wood burning marble fireplace and circular bay alcove with views looking north on Hyde Street to the piers at Fisherman's Wharf and west over the greenery of the Alice Marble Tennis Courts to the bay and Golden Gate Bridge in the distance. The formal DINING ROOM, with chandelier and two pairs of French doors, comfortably seats a large dinner party; it enjoys northeasterly views of the bay and Treasure Island. 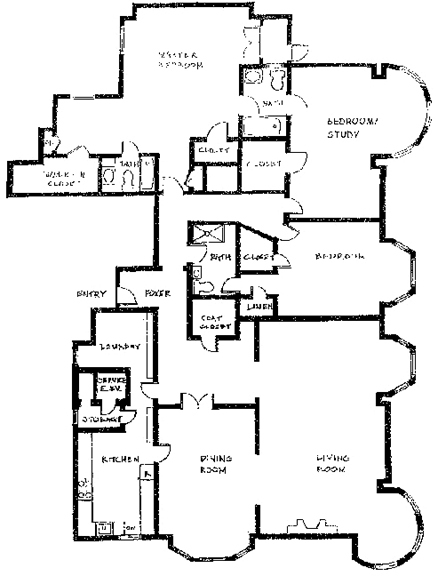 The excellent floor plan divides the public rooms from the bedroom wing which consists of three bedrooms with baths. The MASTER BEDROOM enjoys quiet solitude. It features wall-to-wall carpet, a large walk-in closet and two smaller ones. A glass enclosed porch looks out to Hyde Street. The MASTER BATH features a marble vanity, classic white tile floor and a shower over tub. The very charming second BEDROOM or STUDY features a circular bay with windows looking over Hyde Street. The adjoining FULL BATH also opens to the master bedroom and can serve as his or her bath, making for a wonderful Master Suite. The third BEDROOM also looks over Hyde Street and has two closets and an adjoining BATH with shower. UNIT 612 is granted 21 shares of the total 282 shares in the Corporation. Current dues for Unit 612 are: $4,053.00 per quarter ($2,856.00 operations budget + $1,197.00 reserve budget, excluding property taxes). Taxes are collected quarterly and paid through the cooperative based upon the sales price (currently 1.14%) per Prop. 13. No special assessments are currently contemplated by the HOA. Available documents pertaining to the cooperative HOA and are advised to review the contents prior to submitting any offer to purchase the property. Upon mutual acceptance of a Contract for the Purchase and Sale of Real Property, the President or Secretary of the Board of Directors of the Greenwich Realty Company (the HOA) will provide their Prospective Buyer Information Packet which contains complete CY 2007 to date information, along with the Prospective Owner Application. The Contract for the Purchase and Sale of Real Property is conditioned upon an interview of the Buyer with the Board of Directors and a vote by the Shareholders.